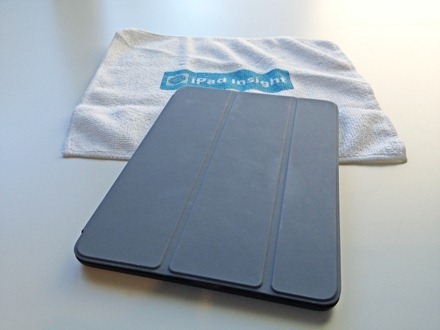 The iPad mini Smart Cover does not come in leather and polyurethane as the larger smart covers do. For the iPad mini there are only the polyurethane covers. They come in a range of six colors – pink, light gray, dark gray, green, blue, and (Product) Red. They are priced the same as the polyurethane covers for the bigger iPads, at $39. The interior side of the Smart Cover is made of color-matched soft micro-fiber cloth. They can be purchased in Apple retail stores at Apple authorized retail outlets, and at the Apple online store. 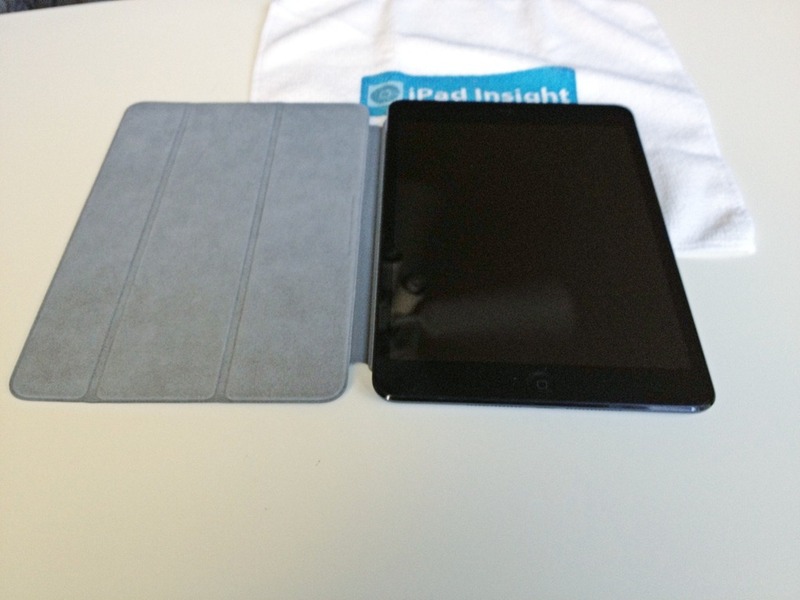 — To paraphrase Dennis Green badly the iPad mini Smart Cover is what we thought it was. 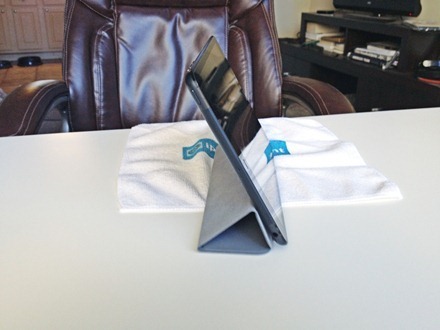 It’s the same great smart cover, just smaller to fit the smaller new iPad. — It feels great on the iPad. I didn’t used to be a big fan of the polyurethane covers; much preferred the leather ones on my bigger iPads – but I’ve quickly come to like this one quite a lot. I don’t think I’d trade it for a leather one now. It helps to grip the iPad mini a bit better too, as the back of the tablet is pretty slick. 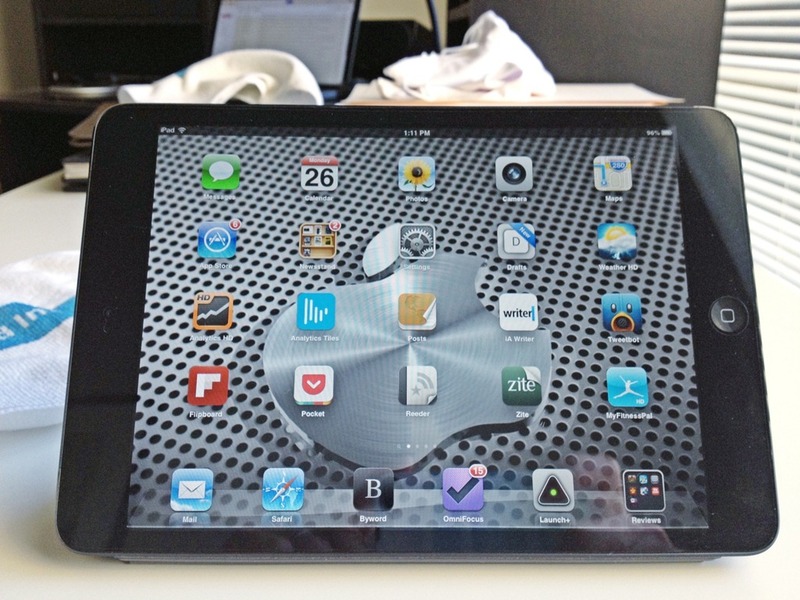 — It’s very, very light – and feels as if it adds almost nothing to the weight of the iPad mini. Lightness is the best feature of the iPad mini, so this is an important quality. — I got the dark gray cover and I think it looks quite handsome too. And it’s picked up very little dirt, scratches, or marks in over three weeks of pretty much constant use. — The automatic sleep/wake feature is still a joy to work with. I’ve been testing out a Google Nexus 7 with a travel cover that doesn’t support this feature and find I really miss it. — The grooves used to help turn the cover into a sort of a stand don’t leave marks nearly as much as the bigger smart covers do. — The latch on the iPad mini Smart Cover is not as handsome as the one on the bigger smart covers. It’s not metal; and also is not as ‘magically’ accurate in snapping onto the side of the iPad mini as its bigger cousin. — As with the original Smart Cover, there’s no protection for the back of the iPad mini. Apple touted the iPad mini as ‘every inch an iPad’ – and that’s proved to be true. The same can be said for the iPad mini Smart Cover – it’s every inch a smart cover. And that’s a very good thing. There are already a number of good 3rd party iPad mini cases around, and many that offer protection for the front and back – but if you like to keep things minimal and keep the iPad mini as delightfully light as possible you’ll be hard pressed to find a better match for it.